This is for a four-pack of travel cases here. Open to US residents only, you have through 9/10 to enter. Time to start planning for those Christmas presents I think. Care for all the animals with the Vet Visit Carry Case. This easy, take-along case has everything kids need to tend to sick pets and help them heal. Set includes one figure, two dogs, one cat, exam table with lamp, stethoscope, medical tools, feeding bottles, medicine, bandages, and tons of other accessories. When playtime is over, simply store the pieces inside the case for next time! Set sail for a swashbuckling adventure with the Pirate Raft Carry Case. This easy, take-along case jam-packed and ready for young buccaneers! Set includes one pirate figure, log raft with functioning cannon, barrel, sword, monkey, and lots of additional accessories. When playtime is over, simply store the pieces inside the case for next time! Create a chic outfit with the Fashion Boutique Carry Case. Enclosed in an easy, take-along case, this boutique has trendy clothing that can be used to dress up the skilled fashion designer. Set includes one adult figure, clothing mannequins, interchangeable dresses, purse, design and sewing tools, and other accessories. 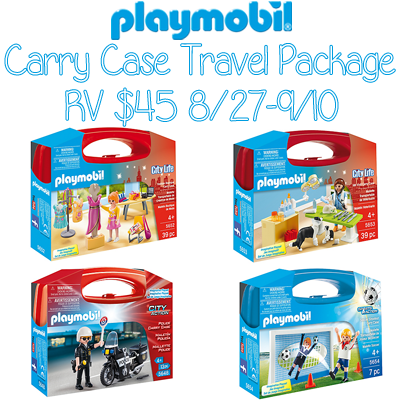 When playtime is over, simply store the pieces inside the case for next time! . My grandaught would like vet. I think the Soccer Shootout Carry Case. my granddaughter would like the vet visit case. My son would love the Vet Visit Carry Case. I think he would love the Vet Visit Carry Case the best. My son would love the soccer case most. My niece would love the Fashion Boutique Carry Case. I think they would like the City Life one. I think my son will like the pirate raft case the best, he loves pirates.